Samsung Electronics on Thursday unveiled two new tablet PCs including the Galaxy Tab S4, its new flagship premium tablet that works as both an ordinary tablet and a desktop PC. 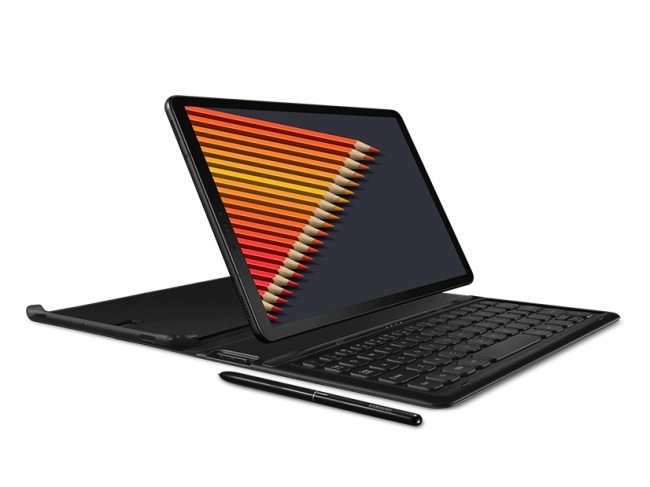 “With the Galaxy Tab S4, we’re introducing a premium tablet, equipped with Samsung DeX that helps consumers perform their absolute best wherever they go,” Koh Dong-jin, president and CEO of Samsung Electronics, said in a statement. It is the first Samsung tablet PC to support connection to Samsung DeX, a desktop extension system, which enables users to use mobile devices like PCs by connecting them with a monitor. The Galaxy Tab S4 sports a large 10.5-inch Super AMOLED display and four speakers tuned by AKG and Dolby Atmos immersive sound technology. When connected to the optional Book Cover Keyboard or launched from the Quick Panel, the newly launched device gives users the option to switch from an Android interface to a desktop experience, Samsung said. The new tablet also comes with the S Pen stylus, an addition being made to the Galaxy Tab series for the first time. It also has prolonged battery life with a 7,300 mAh battery that provides up to 16 hours of video playback. The Galaxy Tab S4 comes in two colors -- black and gray -- and will be rolled out in global markets starting this month. In the US, the Galaxy Tab S4 Wi-Fi version will be available starting from $649.99 on Aug. 10 via Amazon, Best Buy and Samsung.com. In addition to the Galaxy Tab S4, Samsung also unveiled the cheaper, lower-spec Galaxy Tab A, which offers a Kid’s Mode that allows for safe usage by children. The Galaxy Tab A is available in three colors: black, gray and blue.